As a forensic genealogist, Willow Anderson is following in her late grandfather's footsteps in her quest for answers about a baby abducted from the hospital more than twenty years ago. The case may be cold, but things are about to heat up when someone makes an attempt on her life to keep her from discovering the truth. Ex-FBI agent--and Willow's ex-flame--Austin McKade readily offers his help to protect the woman he never should have let get away. Together they'll follow where the clues lead them, even if it means Austin must face the past he's spent much of his life trying to forget. And even if it puts Willow's tender heart at risk. In this fast-paced and emotional page-turner, bestselling author Elizabeth Goddard keeps the stakes high, the romantic tension sparking, and the outcome uncertain until the very end. 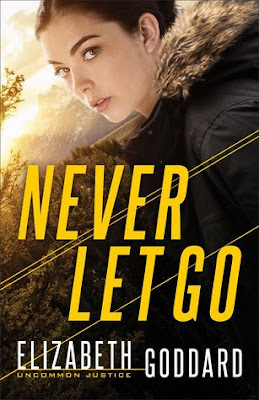 Never Let Go begins the exciting new series by Elizabeth Goddard, Uncommon Justice. I found this suspense filled tale to be quite the page turner. I never knew what was going to happen next with Willow and Austin. It is action packed with unpredictable scenes. I am giving Never Let Go a well deserved five plus stars. I can not wait to get my hands on the second installment from the Uncommon Justice series. I highly recommend this one. I received this book from the publisher. This review is 100% my own honest opinion.